I love the violin. I love playing it, I love learning it, I love listening to it, I love looking at it, haha. But deep down inside I also have a very strong desire to play the cello as well. I'll never be a professional musician, but I would like to one day have a very strong competence with my violin. Would learning the cello WHILE also still learning the violin be imprudent? I have read opposing views, but I wanted to get feedback from users on this forum as well. It seems like a lot of ideas and practices could translate well between the two. Some people claim that splitting focus causes ability with both instruments to suffer, but since I do not make a living as a musician, does it really matter? Anyone out there with first hand experience and/or thoughts on this subject? I really don't see why not, although I am no expert. The biggest difference of playing the violin and cello is the spacing between the notes. The cello has much bigger spaces for each note, so it is easier to play in tune, but you must be able to stretch your hand a whole lot more than you would on a violin. I guess the only reason why you may not want to do that is memorizing the notes on another instrument, as I am sure that could be quite difficult. But really, if you feel like you can do it, then why not? Like all answers -- it depends. Do you already read both treble and bass clefs? Cello sheet music will be written in bass clef, except for way up on the neck where it will change to tenor clef. If you already know both treble and bass, then shifting back and forth between clefs should not present a big challenge. If you don't you'll have to learn at least those 2. Don't worry -- every piano player in the world has done it, so it can't be that hard -- right? The only downside is that you'll be trying to learn two very difficult instruments at once -- but as you say, you're not aiming to go pro anyway, so I say have at it. The cello is a beautiful instrument. I'm not too worried about learning a new clef. I'm good with memorization. I haven't forgotten my ABC's yet and it's been years since I practiced those. I'm only 27, sooooo I figure by the time I'm 47 I'll be ready for my first single person violin/cello duet! I'm with you there @LyleA the Cello is such a beautiful instrument. For a long time I have been really wanting to learn the cello. I did borrow one from a friend for a week and absolutely loved it, I didn't find the switch from violin to cello too difficult, the thing that got me the most was the lowest string is on the right rather than it being on the left for violin. I don't see any problem with learning them both at the same time, if you have the time and inclination, why not. I know from first hand experience with the violin that I don't want to buy a cheap instrument to start on, but I also don't want to toss out $1,000+ for something I'm not sure about either. @LyleA Not like you need encouragement but ...last summer we went to concert at a local park. One of the band members played a cool electric cello. Click on 2 pears dancing!! I like the idea of you renting one for a few months just to get a feel for it first, i would be a bit scared to shell out that much money if i wasn't at least 80% sure i'd enjoy learning it. Then again you could go for a $400-ish electric cello, i'm sure cecilio do one and they're violins are great so i'm sure their cellos would be playable too, you'd maybe have to get new strings and take it to a store to have the bridge re-sized. I'm sure fiddlerman sells then and i know amazon has them too. 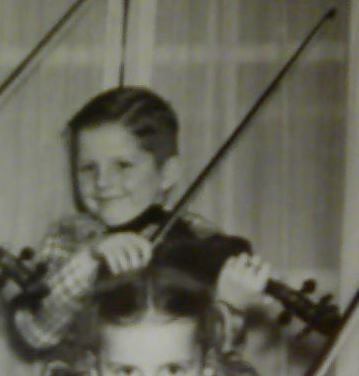 @Schaick I tried an electric violin once and could never get 'into' it. I guess I like the acoustic sound better. @mischa91 Yeah, I think renting is a good way to go too. If I do get one, I will make sure to post my thoughts! Contacted my local violin shop, and I can rent a cello from them for $180 for three months. Seems about right I suppose, maybe a little high, but I'm not familiar with standard rental rates. One nice perk, however, they put 80% of your rental fees toward store credit for purchasing an instrument with them if you so choose. Learning more than one instrument at the same time never hurt this guy, so I'd go for it. Just checked my luthier's rental prices. Violin / Viola $16.00 per mo. Double Bass, $45.00 per mo. 75% toward purchase of anything in his shop. But different locations constitute different price range's I recon. @Fiddlestix I remember Roy Clark from Hee-Haw re-runs when I was little! Thanks for those vids. Yeah, the shop that is near me is the only one in the ENTIRE state that I am aware of. So they can pretty much set any price they want. I still don't think it's unreasonable though, and I imagine I will probably go for it in a few weeks or so. Some people are super good with Multiple instruments. I bought a cello a few years back. I adored it. It did not find it hard to play or the clef hard to read. I was not great at it. I gave it up when I really put my focus into the violin and I didn't want too many distractions. Oh oh oh how I miss my Cello. Let me state for the record that I play both cello and violin (not at the same time, you understand). I also own a viola that doesn't get much use. The only limits on what a person can learn are in the mind of the person learning. Don't let anyone tell you otherwise, not even yourself. If you want to learn the cello, then by all means, go for it, while still learning the violin. Intonation is a problem, given the sheer size of the thing, but as with the violin, that can be overcome with practice. It's a lot easier to play off-key on the cello, trust me! It's been the most frustrating, yet rewarding, experience of my life thus far. I wish you well in all your future endeavours!